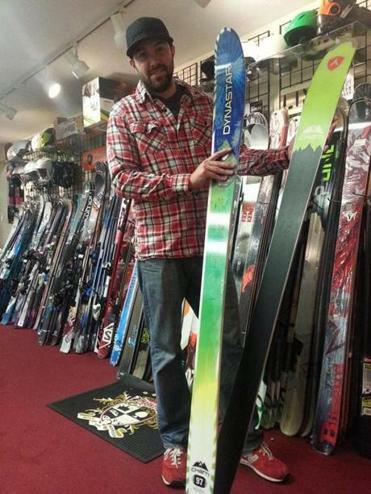 Mike Murphy of Sportworks estimates he sells only one snowboard for every 25 sets of skis. Like most young men who work part time in ski and board shops, Adam Sanchez is a student of the products he sells. A junior at Bridgewater State, he has also seen plenty of changes in snow sports, despite his young age. He started as a skier in junior high, then took the almost inevitable turn teenagers do into snowboarding. For about two decades, that was the way of the winter world: Snowboarding was by and for kids — at one point it rescued a moribund ski industry in the 1990s — and was seemingly destined to grow forever. But with Sanchez and thousands of other young people, the ball has taken another unexpected bounce, as snowboarders have been bailing out in droves. It’s called rocker, or reverse camber (tech details later), and it allows skiers to take advantage of another of the sport’s trends: skiers and boarders skiing the groomed trails in sometimes densely wooded glades where making quick turns in loose snow is the required art form du jour. To Sanchez and other young skiers, the new rocker generation of skis simply work better. Whether it’s technology, culture, demographics, or some combination, the trend is clear that snowboarding, once in skyrocketing ascent, has leveled and even declined in many markets. Earlier this year, in a report published in the National Ski Association Journal, RRC Associates director of operations Nate Fristoe warned that the growth of snowboarding was reversing itself. No one, it seems, is clear on the entire picture, but the numbers add up from every region of the US snow-sports market. In its ﬁrst decade of popularity, beginning in 1991, snowboarding grew from a 7.7 percent share of the skier market to 32.6 percent in 2000. Since that was a decade when skiing’s growth was at a standstill (or in slight decline), snowboarding has been referred to as having saved the industry. The snowboard scene bloomed as a kind of counterculture to mainstream skiing, featuring the familiar baggy clothing and any number of bad-boy touches borrowed from the hip-hop world. And even while some boarders reveled in being the rebellious alternative to mainstream skiing, boarding itself was slowly being co-opted by that mainstream. At the 1998 Winter Olympics in Nagano, Japan, when boarding competition was introduced as a sport, one of the ﬁnest riders in the world, Terje Haakonsen of Norway, boycotted the Games because snowboarding had capitulated to the control of the International Ski Federation. To Fristoe and others in the industry, that translates into less available cash and, more than likely, steady jobs. But Murphy said the manufacturers who once produced more rigid high-performance skis now lead the charge with softer quick-turning skis with rocker technology, and that change stalled snowboarding’s ascent. “Parents in this town see that the twin tips still have the graphics and the baggy clothes, but they ﬁgure that at least their kids are not going over to boarding,” said Murphy. Because the skis using the rocker have no camber — a rigid curve weighting the tips and tails of the ski — the new skis tend to ﬂoat in the soft snow and turn quickly. They still have metal edges to grip harder-groomed surfaces. Perhaps it is too early to blame the new ski technology for the slowing of interest in snowboarding, but it does appeal to the kind of younger skiers who want to be outside the groomed bounds of a traditional ski area. Kapuscinski, Fristoe, and other industry watchers say they’re looking for signs this holiday weekend of what the new season may bring. Equipment sales and early bookings don’t reveal much, but at this point, most in the recreational snow sports say they have no reason to expect much change.